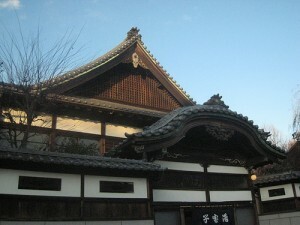 The Edo-Tokyo Open Air Architectural Museum is a museum of historic Japanese buildings in Koganei, Tokyo. Since it’s located in suburb of Tokyo, it’s not so crowded unlike major tourist attractions in Tokyo. The most popular building in the museum is the public bath house called “Kodakara-yu (Bath of Blessed with good children)”. It looks like a temple, why? Temple-like public bath houses were common in Japan. The reason is because baths were more like religious ritual, and bath houses were originally placed in temples for monks to clean their bodies. It’s said that “cleaning the filthiness of the world” symbolize the land of Perfect Bliss; therefore, the entrances of public bath houses were like temples. In bath houses in East Japan, they usually have Mt. 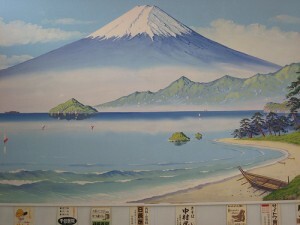 Fuji murals in their baths spaces. The picture below is the one in the Kodakara-yu. Taking bath by the landscape mural is nice. It just like taking open air bath. But it that’s not the only reason. Mt. Fuji has another name “fuyouhachida” which is related with Buddhism, so it makes sense that a big mural of Mt. Fuji is in a temple like bath house.